Does the dark side always exist as a different identity within you? Anakin Skywalker and Darth Vader are two different persons inhabiting the same body, who agrees with such a view. The script and novelisations also show that such duality appear to exist between Palpatine and Sidious. In Disney canon, Kylo Ren also appears to consider himself different from his birth identity. This suggests that, from a philosophical standpoint, one's dark self is different and separate from one's natural birth self. Is this specific only to these three, or is it true of all Sith (Kylo's could be just yet another instance of Vader worship), all dark siders or even all living things in general? Edit: I included Kylo Ren because it's another case of such a duality that we can observe going on in the novelisations. However, I am interested to know of examples and counterexamples in past and future Sith, including ones in Legends, where such dual identities exist. Since he was trained with a dark side alignment from birth, his birth identity was the same as his dark side identity. I'm not aware of any indication that Maul ever had a "good side" or "light self". The dual identities we see in Vader, Sidious, etc., seem to be mostly due to the fact that they started life aligned with the light (Vader and Kylo Ren) or neutral (e.g., Sidious, who did not become a Sith apprentice until he was an adult). The dual identities are also an artifact of Vader's psychological need to forget his past life with Padme and Sidious' need to publicly separate his Sith identity from his political one. It makes sense, from a certain point of view. Luke saw his philosophical 'dark side' in ESB, when fighting image of what he though was Vader. Yoda battled his dark side in Clone Wars. Vader and Obiwan are pretty clear about Annikan being killed by his dark side, I think even the emperor mentions it. When they turn, they always change their name. In one of the prequels, can't remember now, someone mentions they have to fight and resist their dark side. I would say it depends on the point view of the person who falls in the dark side. 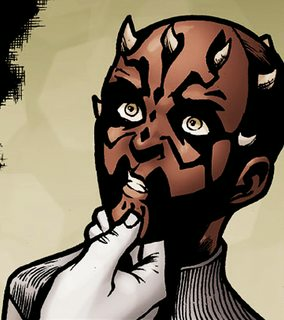 Darth Maul has only one name and identity as mentioned earlier. Darth Sidious and Palpatine is considered to be the same person. Because they have both personalities and goals.Palpatine's disguise as Supreme Chancellor is a conspiracy to the galaxy. As you see in ROTS, he revealed as a Sith lord. Darth Tyranus and Count Dooku are just one and the same person. Yet,only few people knew that Dooku is Darth Tyranus. Like Sidious(Obviously),Jango Fett and Poggle the Lesser. Dooku's sith identity was secret,like Palpatine. When it comes to Anakin Skywalker and Darth Vader, it is psychologically considered to be different from one another. Like Obi Wan said that "He betrayed and murdered your father". This convince us that anakin and Vader are separated. In ROTJ,Darth Vader tells luke when he hear"Anakin Skywalker", Vader replied "That name has no longer any meaning for me". It means to Vader that He killed Anakin.One episode in Star Wars Rebels,Darth Vader said "Anakin Skywalker was weak, I destroy him".Unlike Sidious and Tyranus they do not separate their sith identity to their public identity. Not the answer you're looking for? Browse other questions tagged star-wars star-wars-legends the-force or ask your own question. Does Tyranus consider himself separate from Dooku? Can Kylo Ren Actually Communicate with Darth Vader? Does the term “Light Side” actually exist? Are there any lightsaber forms specific to the dark side? The Force Dark side posses you? Does biological evolution exist within the Star Wars universe? What Dark side organizations exist in Star Wars universe, apart from The Sith?